TAVLIT expands its offering with standard filter batteries for various flow rates. The batteries are based on the semi - automatic screen filters TS and supplied complete with all components and are ready for field installation. The flexibility of the systems offered by TAVLIT enables users to have the perfect solution for their needs. For AG, turf and landscape irrigation when higher flows are used. Most suitable for low quality water. 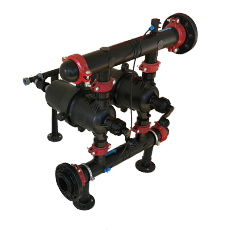 Enables the user to perform flushing without dismantling the filter. Applicable when water supply cannot be interrupted even during flushing. Customizable according to client requirements. Water supply to the field in uninterrupted during flushing.